This one came highly recommended by my sister-in-law. And I can see why! The smoky, garlicky taste of the chorizo sausage, the plethora of healthy vegetables, the delicious curry aroma. My sister-in-law is a big fan of Jamie Oliver's cookbook, 'Food Revolution,' and when she recommended this recipe to me for Souper Sunday, I searched for it on the internet until I found what appeared to be a close representation of it. It was right when I was about to put the pot of vegetables onto the stove that I realized that the pictures of the sweet potato in the two recipes that I had found on the internet showed the flesh of the vegetable to be orange rather than white like mine. Uh oh. I texted my sister-in-law, who has relatives in the UK, and she advised that in the UK they call sweet potatoes what we call yams here in Canada. I asked what they call the vegetable that we call a sweet potato, and she said they don't have those there. Interesting. So, since Jamie Oliver hails from the UK, in fact this recipe should be called Chorizo and Yam Soup for us North Americans, however not realizing this until after my vegetables were already in the pot, I have made a Chorizo and (Canadian/American) Sweet Potato Soup. Oops. 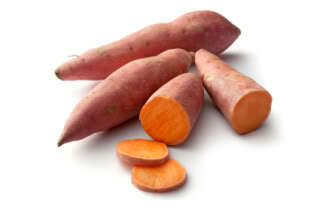 Fact - sweet potatoes and yams are not even in the same family of vegetables. For this reason I find it very odd that just because of being separated by a gigantic body of water North Americans call the orange tuberous root vegetable a yam, and those in the UK call it a sweet potato. 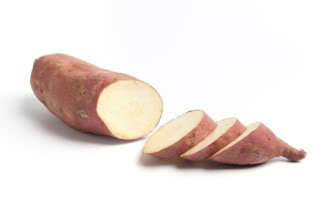 And how do they not even have what North Americans call a sweet potato over in the UK? At my Thanksgiving dinner this year I served both a sweet potato dish and a yam dish. This is all leaving me very confused. You learn something new every day! The good news is that I find yams and sweet potatoes to taste really similar to one another anyways. Also, the curry powder and carrots give the pureed final product a nice orange-ish hue that I thought I may be missing from not using yams. All in all, it's a recipe that I would make again with (Canadian/American) sweet potatoes, but would also love to try it with the yams next time to see how the flavour differs. Place a large pot over medium-high heat and add the olive oil. Add the carrots, celery, onions, garlic, sweet potatoes, chorizo sausage, parsley, curry powder, and fresh chile to the pot, and saute, with a lid mostly covering the mixture, for about 10 minutes or until the carrot has softened and the onion is starting to brown. Add the broth to the pot, and bring to a boil. Reduce the heat, and simmer for 10 minutes or until the sweet potato is cooked through. Season with salt and pepper to taste. Using an immersion blender, puree the soup until smooth. Alternatively, use a blender to puree the soup, working in batches, but make sure that the soup has cooled off before doing so (then when finished pureeing return to the pot and heat). Variation: Next time I think I am going to leave the chorizo out until after the pureeing step, then add to the soup in slices.